The AL TA/NSPS Land Title Survey Standards were reviewed and updated upon the merge of the National Society of Professional Surveyors and American Congress of Surveying and Mapping (ACSM). The changes to the requirements will take effect February 23, 2016. 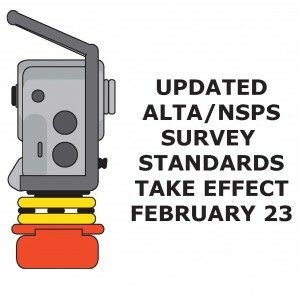 As a provider of ALTA/NSPS surveys, below we have highlighted a few changes that clarify both the surveyors’ and the clients’ responsibilities in complying with the requirements. The degree of precision of the dimensions shown on the plat or map are now based on the surveyor’s professional judgement when considering the planned use or existing use of the property. When a new description is created for a property, the surveyor must now explain how the new description relates to the old description. The nature of the documents that must be provided by the client to the surveyor to identify the property is more clearly defined in Section 4 of the Standard. A summary of the plottable easements and servitudes with an explanation stating if each item is shown on the survey is now required. The surveyor must locate both edges of the adjacent travelled way including divided streets and highways unless the documents provided to the surveyor indicate access is not permitted. Item 11(a) was eliminated from Table A and made a requirement in Section 5. Item 6 clarifies that a report or a letter explaining the zoning information that the client/owner wants identified on the plat must be provided to the surveyor, by the client. Item 8 now includes “substantial areas of refuse” as a result of the elimination of Item 18 concerning solid waste dump, sump or sanitary landfills, which is a conclusion more appropriately identified in a Phase One Environmental Assessment. Item 20(b) was eliminated to prevent trespassing on others’ property. “Monuments placed (or a reference monument or witness to the corner) at all major corners of any offsite easements or servitudes benefitting the surveyed property and disclosed in Record Documents provided to the surveyor (client to obtain necessary permissions)”. Item 20 Professional Liability Insurance certificate is furnished upon request, but is not shown on the face of the plat or map. Additional Table A items added by client are all to be identified as Item 21. These are just a few highlights from the complete standards. Please reach out to us for further information on all of the changes and amendments. We are happy to answer questions and provide updates to surveys during the entitlement process.